Ella (Lily James), a daughter of a merchant who remarries following the death of his wife, is eager to support her father as she welcomes her new stepmother (Cate Blanchett) and her daughters Anastasia (Holliday Grainger) and Drisella (Sophie McShera) into their house. But, when Ella’s father unexpectedly passes away, she finds herself at the mercy of a cruel new family. One day, Ella meets a stranger in the woods. Unaware that he is a prince, Ella finally feels she has met a kindred soul. When the Palace sends out an open invitation for all maidens to attend a ball, Ella realizes it’s her chance to once again see the charming Kit (Richard Madden). However, her stepmother forbids her to attend. 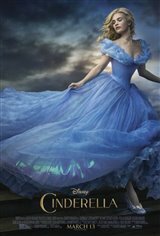 But a kindly beggar woman (Helena Bonham-Carter) steps forward and changes Cinderella’s life forever.